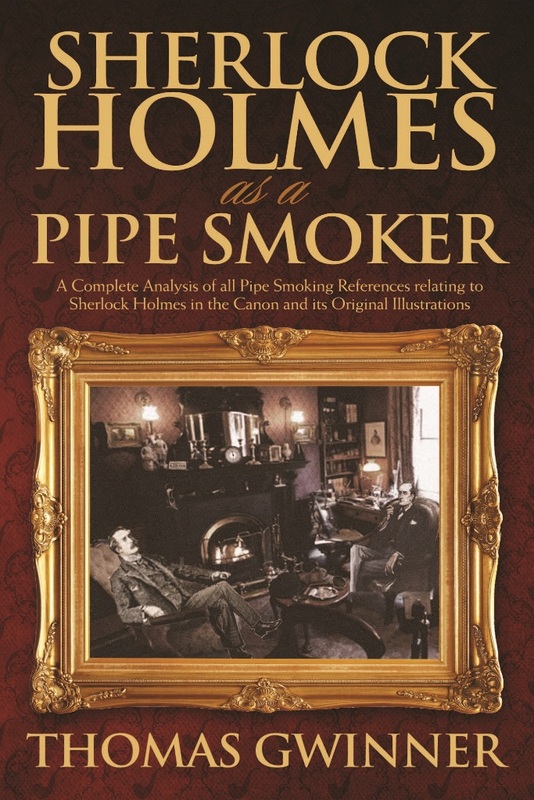 “I was recently sent a copy of a new book, Sherlock Holmes as a Pipe Smoker, by its author Dr. Thomas Gwinner. Since Sherlockiana is one of my hobbies, I was intrigued by the subject as much has been made about the references to pipes, tobaccos, cigars and cigarettes in the Canon. What made this especially interesting is that it only assesses the mentions where they apply to Holmes himself, and his pipes and tobaccos. I always remember the pipes that appeared in the 56 short stories and four novels – a clay, a cherrywood and a briar. Dr. Gwinner launched into a much more detailed analysis, though, using information from the illustrations to help round out his findings. Some of the notes are quite thought-provoking, such as: is the cherrywood actually a pipe made of cherry, or does it refer to the shape, which is similar to a poker with a slanted bottom, and usually with a bit of a bend in the stem? Although the thought had occurred to me in the past, this is the first time I remember anyone remarking on the idea. He also goes into detail about the controversy over the gourd calabash as it relates to Holmes. His conclusions don’t exactly clear up the mystery as it relates to the identification of the gourd calabash, but it is thought-provoking, and that’s part of the fun of being a Holmesian. Just as scholarly is his approach to Holmes’ tobaccos. We all know about the black shag that Holmes smoked, and his (disgusting) habit of drying his dottle for resmoking at a later point, but Dr. Gwinner did quite a bit of research to try to pinpoint where Holmes must have gotten his tobacco. I was really fascinated by the combination of facts and conjecture that became distilled into his conclusions. The book is remarkably illustration-heavy, with many coming from the original artwork of Sidney Paget and Frederic Dorr Steele, among others. It is also replete with charts to help clarify the information, and the bibliography alone gives some insight to the amount of research that went into this tome. He even went as far as to catalog the individual lines from the stories that he used as the basis for his work. If you’re a fan of all things Holmes, this is one book you should definitely add to your collection.” Reviewed by Talking Tobacco Sherlock Holmes as a Pipe Smoker is available from all good bookstores including The Strand Magazine, Amazon USA, Amazon UK, Waterstones UK and for free shipping worldwide Book Depository.